“Bill, I’m not a Sea Org member, I’m a student on the OT courses I was a volunteer on the way down here..” “ This is an important mission and Mary Sue Hubbard selected you personally.” “I think I finished OT3.” “You have. Me too.” We just looked at each other for some seconds. Then Bill said, “ come on get dressed I’ll be waiting outside. “Bill, where are we going”? “Malta” He went out. We went up to a briefing room. I wanted to say good bye to some friends and new girlfriends. No chance. Missions fired fast. As JoanM, MSH’s aide explained it there were no pictures of they who we would hunt..
“What I did do is to find two people who personally knew him.” Then the door was opened and two women petty officers entered. With them we pieced together a mental image picture of what he looked like. We knew his name though I don’t say it here. Joan told us his arrival dates and the airline he flew in. That was all of the knowledge of the mission that we got. We were to find these people, recover the stolen materials and close down the operation. We received our plane tickets and expense money. Our clothes were packed and brought to us while I told Bill about Malta. I knew that it was three islands in the Mediterranean Sea between Libya and Italy. It was an ancient place. Departure was down the gangway to a waiting cab. A few of the students I had been partying with the night before were early risers. They looked at me quizzically. Waving casually I tried not to look mysterious. I got in the cab and we left. We arrived in Valetta, Malta int the late afternoon. Going through customs Bill noticed an arrival and departure book in the customs office. We rode into town and set up in a hotel. We had no comm lines. We were on our own. I took a walk to check out the town. Bill went back out to the airport. With a a well placed small bribe Bill was able to study the book andfound our target had a local address. He picked me up along the way and we were soon at a large apartment building. Square and imposing the building was built around it shafts where small balconies came out from the apartments around all the sides. There was no answer to the repeated bell rings at the address. We found a small bar nearby and waited, repeatedly checking the apartment but no one came. Back at the hotel we decided on a new plan of action for the next day. The next morning after a good breakfast of eggs benedict at an outdoor café we returned to the apartment. .There was no response again to our repeated ringing so we went to our contingency plan. At the top of each stairwell were two apartment entrances. I would check out the one opposite our targets apartment while Bill would check out the airline places and schedule to get an idea of the return flights. I rang the bell of the opposite apartment. A young lady dressed as a maid all in black with a white apron who was very pretty opened the door. “Hello, do you speak English”? She gestured with her hands raising them to shoulder level. “A leetle,” she said. “Do you know the people across the hall? I’m trying to find a friend of mind, Paul___”? “Non capisco tutti, no understand.” I shifted into Italian and asked the question. “She answered,” non qui casa.” They weren’t home. I knew that. I asked her when they would be back. She looked at me intently, smiling. Then she asked if I would take her to a café for coffee. Thinking she had information I agreed. She said ,” un momento per piachere” She returned in moments in a short dress. Over coffee she told me she saw them rarely but often heard them on the steps. There had been a group of people and children but, for the past three days had not heard or seen them. She couldn’t tell me more. She was telling some of her story and we talked as I walked her back to the apartment. Upstairs we shook hands in the alcove of the apartments then she pulled me close and kissed me. I had a half hour before I had to meet Bill. We met and decided that we had to get inside the apartment that night. We agreed that it was possible that the people had left the island. We explored downtown Valletta. The old fortress island of Malta was built in descending tiers of steps leading even deeper into the bowels of the island. Many of the streets were wide steps. Cars bumped up and down them. We went back to the hotel and had dinner. When it was dark we went to a bar in the vicinity of the apartment and dismissed the driver. I checked the doorbell again. No answer. So we went up the stairwell to the roof. There was an iron bar across the air shaft. I secured the rope we had brought then went down the rope to the balcony. I had to force the glass door with a small crowbar we had bought earlier with the rope. I saw that the apartment was empty. In a wastebasket I found a crumpled piece of paper. It had an airline and a flight time to London. The day was today. I opened the door to Bill and motioned him to come along. Outside I told him they had just left Malta. Back at the hotel Bill placed a call to our international headquarters. In terse terms he explained our mission and that the party would be arriving at London’s Heathrow airport within hours. We asked them to contact Scotland Yard and have them arrested. We had a beer and discussed what we had done. With almost no information we had tracked someone we did not know or have a picture of. Within 24 hours we had located him and completed the mission. Saint hill people and police picked him off the plane and recovered all materials. We had a good dinner. We made reservations on a morning flight to Madrid then on to Valencia. We we flew out of Malta that day I did not know I would be returning again on a different mission under much more pleasant circumstances. On the way to Madrid we felt exhilaration. We had completed our task. We both felt that we were in telepathic communication with LRH. In own minds we heard his voice saying a hearty “Well done”. We returned to Apollo. It was the early hours of the morning. Bill reported our return and was debriefed. I returned to my cabin and was soon asleep. A mission staffer found me later enjoying dinner next to the galley. Over coffee she asked me a few questions relating to the mission. I could tell she already had the information. When she got up she put he hand on my shoulder and told me, “Both MSH and LRH had relayed to me a well don.” “Thank you” I replied. I knew that. The next day I saw posted in the orders of the day that Bill Roberson had been appointed Captain of Apollo by LRH. He came to me next morning. 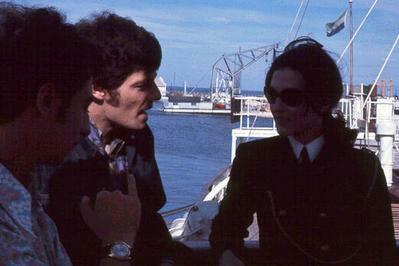 We sat on a bench on the poop deck, the harbor of Valencia around us awash in springtime sunshine. “What are you going to do now"? He asked. “Are you going back to Saint Hill”? “I’ve been giving that some thought.” “I need someone to take over division 1. I need a third mate.” I laughed saying “I haven’t signed the Sea Org contract.” “That’s ok” he said “Just take the job. I really need a good hand.” “Okay,” I said smiling into his face. We stood up and shook hands. Smiling, he said, “Take over now will you? I believe your message center is running over.” I laughed again then went down into the between decks to my division. I went to work. Ha, great to read your stories. Those were wild and adventurous times, eh. Probably very strange to people who haven't been through anything like that. For me, every day in those times was exciting and interesting. Clear is not a thing. It is a state after negative spontaneous reaction responses are gone.